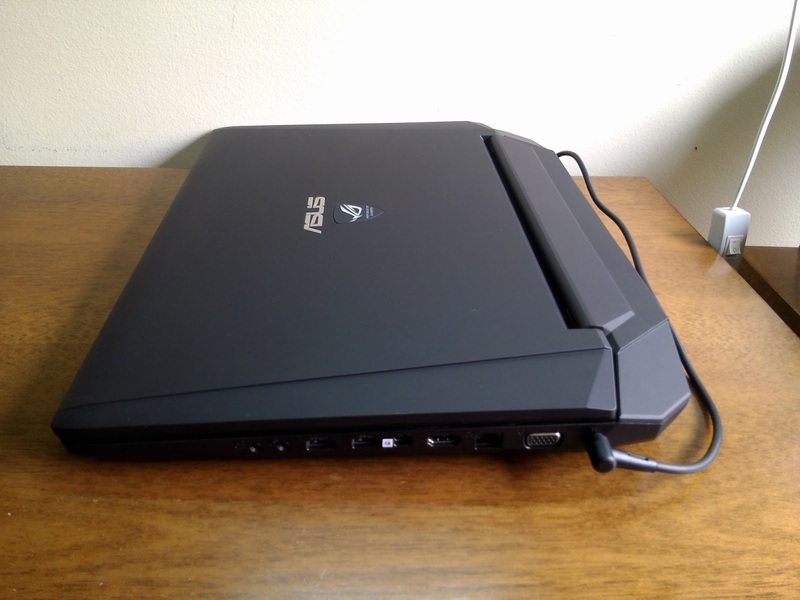 Another WMC event, and another ASUS ROG gaming laptop to impress us. 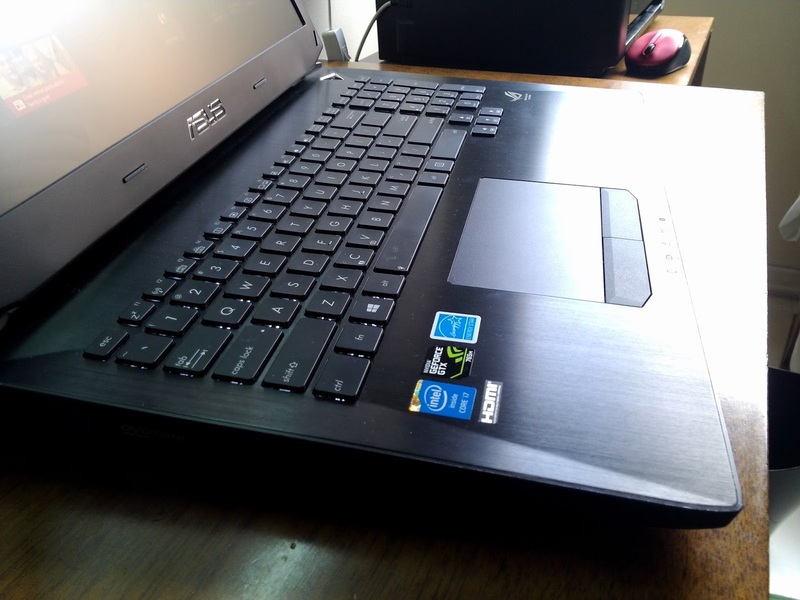 ASUS' latest G750 gaming laptops retain what the previous G-series laptops excelled at, and add an improved design, the latest Intel Haswell and NVIDIA GeForce GTX 700M hardware, and run the latest Windows 8. 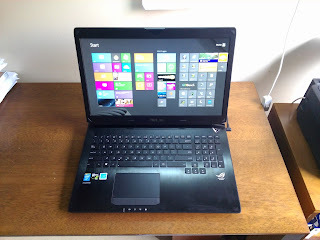 The G750JW is the laptop we have for review today, and it sells for a reasonable starting price of $1,249. The G750-series laptops feature somewhat aggressive,intimidating design, which has been part of the Republic of Gamers brand's identity. Inspired on a stealth fighter and with a jet black paintjob, the G750s have "gaming" written all over them. 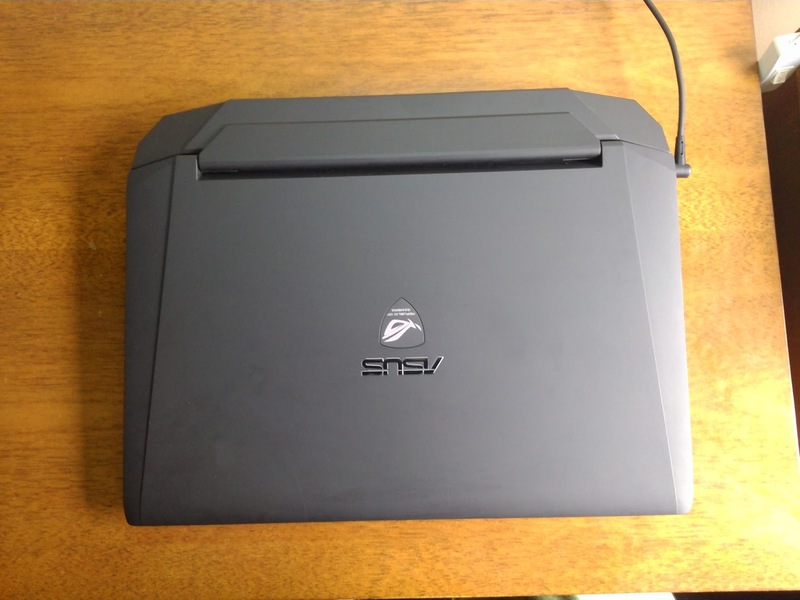 The outside of the lid is very rubbery, but unfortunately it can be a fingerprint magnet at times. On the center is a large ASUS logo, and beneath it is the Republic of Gamers branding, which illuminates when the display is on (in a similar way to the MacBooks' illuminating Apple logo). 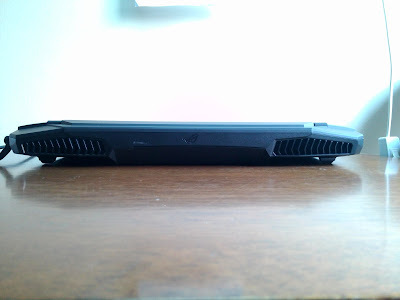 The back of the laptop houses two large air vents for the laptop's elaborate cooling system. This ensures that you don't hear the coolers as much (they're very silent anyways) and you won't have hot air blowing into your hands while using a mouse. 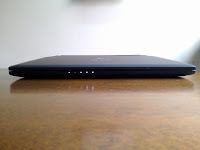 The left side houses a Kensington Lock, two USB 3.0 ports, a DVD burner and a SD card slot (from left to right). The right side contains the charging port, as well as VGA, Ethernet, HDMI and Thunderbolt port, as well as two more USB 3.0 ports and a 3.5mm microphone jack and headphone jack. With all these ports, you'll never be disappointed by the laptop's connectivity options. Open the laptop, and you have, fitted in a black-colored, brushed alumunium chassis, a backlit, chiclet-style keyboard, and beneath that there's a large touchpad with very tactile left and right buttons. The aluminium chassis is very pleasing to touch, and makes typing comfortable, and ensures the palm rests don't heat up at all, even during intense gaming. 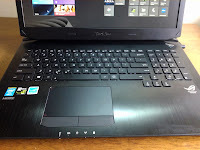 The keyboard itself feels very solid, and typing on it is very easy. The large screen size also allows for a numeric keypad to be included. Also, the backlighting of the keyboard makes typing in the dark an easy task. The G750's display is, to put it simply, beautiful. 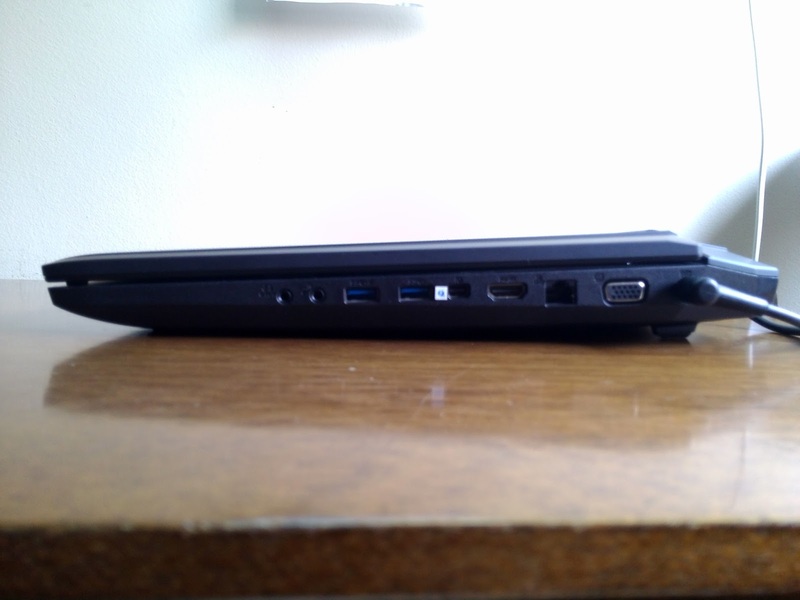 It has a LOT of screen size for a laptop, measuring 17.3 inches diagonally. The 1920 x 1080 Full HD LED Matte screen makes for crisp text and clear images, as well as very rich colors, and also reduces bothersome glare. However, some grain is visible when viewing text on a white background, but that's an easily forgettable issue. Especially when watching videos or playing games, the G750's display is astounding due to its deep colors, high contrast, high resolution, and large size. Well, this is a gaming laptop, so evidently the most interesting part of it is its performance. 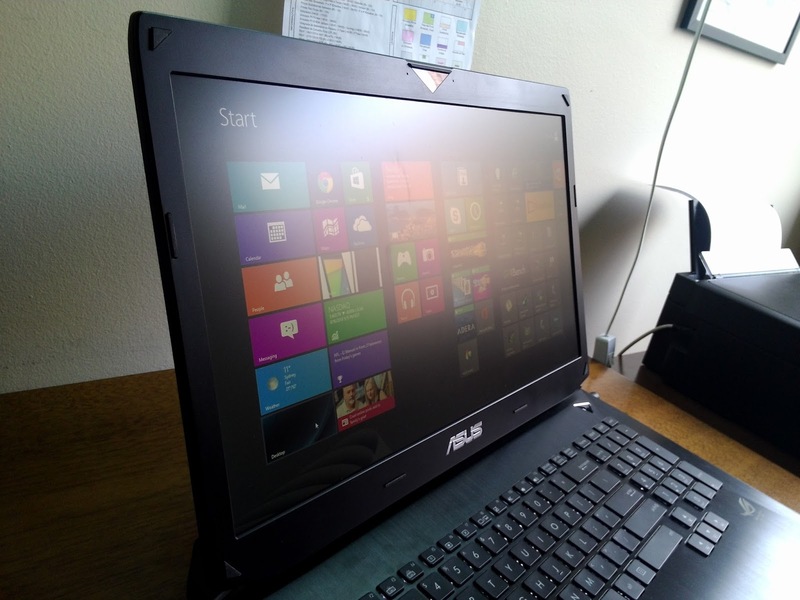 And ASUS does not disappoint. All of the G750 laptops are equipped with Intel's latest Haswell Core-i7 CPU and a high-end GeForce GTX 700M series GPU. In the case of the G750JW, we're looking at a Core i7-4700HQ CPU (4 cores/8 threads @ 2.4GHz, up to 3.4GHz with Turbo Boost) and a GeForce GTX 765M GPU. The choice of the 765M is very interesting, because it almost exactly matches the Xbox One's GPU in terms of clock speed and core count. The 765M is based on the very efficient Kepler architecture, and contains 768 shader cores, 64 TMUs (Texture Mapping Units) and 16 ROPs (Render Output Units). The default clock speed is 797 MHz, but the thermal-based GPU Boost 2.0 can ramp it up to 901MHz. Basically, the GPU clock will be boosted to 901MHz when needed until it heats up to a certain thermal limit, and then the clock returns to 797MHz. Thanks to the G750JW's very good thermal design, though, I didn't once see the clock drop below 901MHz in my testing, and I can assure that the 901MHz clock can be kept for at least one hour of looped benchmarking, but it can probably go for way longer. This GPU has 2 GB of 128-bit wide GDDR5 memory @ 2GHz nominal clock (4GHz effective), resulting in peak memory bandwidth of 64 GB/s. At the default clock speed, the GPU can achieve 1.22 TFLOPS performance, and with the GPU Boost 2.0, the compute power goes up to 1.38 TFLOPS. Like I said, though, the GPU Boost can be kept for an indefinitely long time, so you'll be enjoying the 1.38 TFLOPS figure mostly. These numbers stack up pretty well against the Xbox One's GPU. In comparison, it has the same core count (albeit with 16 less TMUs than the 765M, as in 64 vs 48 TMUs), with a clock speed (853 MHz) that gives the GPU 1.31 TFLOPS. So as long as the 901MHz clock can be kept constantly on the 765M, you'll even have a bit more compute than the Xbox One, and without the GPU Boost clock you'll still get pretty close to it. The only place where the 765M has a potential disadvantage is its limited memory bandwidth. Against the 256-bit wide DDR3-2133 memory of the Xbox One (68.2 GB/s), the difference is negligible, but taking into account the huge bandwidth optimizations the on-die 32MB eSRAM gives the Xbox One, the 765M is left behind by a big margin. Of course, you can easily overclock the 765M's memory to give up to 76.8 GB/s bandwidth (due to the GPU Boost 2.0 not being visible to the software, I couldn't overclock the GPU cores, just the memory). The limited memory bandwidth is the 765M's biggest potential bottleneck, though in my testing I didn't see the memory controller hitting its limit without the GPU load being at 99% too, so the memory bandwidth seems to be on par with the compute power available. However, I highly recommend you overclock the memory. It can safely be overclocked to 2.4GHz, which gives 76.8 GB/s of bandwidth, and is quite a leap from 64 GB/s. I will run a few benchmarks and then update this post soon. So basically, the 765M is a very safe choice, because it means that, theoretically speaking, you'll be able to run any game as well as an Xbox One would, unless perhaps if it's too heavy on the memory bandwidth. I tested Resident Evil 6 and Assassin's Creed III on it, and, while Resident Evil 6 ran virtually flawlessly at 1080p, with max settings and the highest Anti-Aliasing option, Assassin's Creed III, at 1080p, would require me to lower Anti-Aliasing and Shadow quality, and would run pretty smoothly (but still, it could relatively smoothly, read: slightly non-smoothly, render large forests even with Environment quality set to max). So 1080p gaming is perfectly possible, but you may have to reduce a couple of settings to get mostly smooth framerates, and with a 765M, you'll at least have the comfort of knowing that you're on par with a current gaming console. Our review unit came only with a 5400 rpm 1TB hard drive, since it is the entry-level $1,249 G750JW, and the lack of an SSD hits the general speed of the computer significantly, particularly when booting the PC. Not that the hard drive is painfully slow, but it's still by far the weakest component of the whole setup. This unit also came with 8 GB of RAM, which is definitely enough for the most demanding games, but may not be enough in a few years. ASUS makes this easy to remedy, though, as the two hard drive slots and two of the four RAM slots are easily accessible through a lid at the back of the laptop, so you can just pop in an SSD or some extra RAM quite easily. If you have the money, I'd really recommend putting in the SSD, because with that addition, the computer will be simply blazing fast (not that it's not already like that for most uses). You can see how the lack of an SSD bogs down the laptop here. While CPU, RAM, and GPU benchmark scores all resonate relatively uniformly inside the 7.0-8.0 range, the hard drive is way off, with a score of only 5.9. However, this will only be a problem in situations that use a lot of I/O, so gaming performance will not be affected, it will make loading times longer. Well, so how good is the G750JW? for its price, excellent. 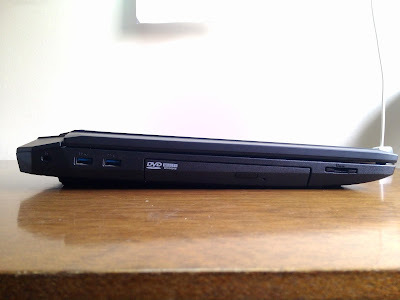 I don't think there's an alternative in the market (except perhaps Toshiba's Qosmio X75, but that laptop compromises with a not-so-good design) that can offer so much quality and performance for that price. Basically, it's like the top-end G750JH, but with a watered-down GPU, no SSD and less RAM. Hence, I highly recommend the G750JW for anyone who is looking for a gaming laptop that performs very well, but can't afford the top-end beasts. 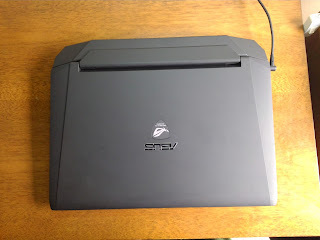 And if you have the money, the higher-end G750JX/JH models are what I consider to be the best gaming laptops around.